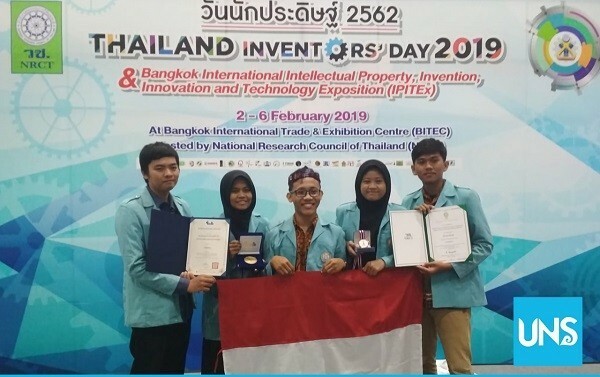 UNS – Five Universitas Sebelas Maret Faculty of Teaching and Education (FKIP UNS) students won a bronze medal and a special award in the “Thailand Inventors Day and Bangkok International Intellectual Property Innovation and Technology Exposition” (IPITEx 2019) in Thailand (2/2-6/2019). Ragil Setiawan, Andreas Wegiq, Achasanul Fiqri, Tsara Devita and Fauzi Derita Saputri who are members of Pandawa LSP Team FKIP UNS, created Automatic Multifunction Laptop Bag (AMPLOP BAG). This multifunctional bag was invented to prevent the side-effects from using laptop incorrectly. Not only as a laptop carrier but this bag was also designed as a laptop desk to help and comfort the user. The user can adjust the desk as comfortable as possible to avoid the backbone will not bend over while using the laptop. In addition, this bag can expand the radiation of electromagnetic by the laptop so it will not affect the human organs. “Nowadays, we frequently see people put their laptop on their laps when operating it. On the other hand, it harms the productivity of the sexual hormones due to the radiation of electromagnetic from the laptop. Some people also put their laptop on the floor and bend their backbone. It can cause kyphosis (abnormalities of the spine) if it happens for a long time. Moreover, a nerve clamp also will occur on the spine that can lead to paralysis. Those are the reasons we established this bag,” said Fiqri. This bag has many advantages that will help the users. First, it is completed with the secondary battery to back up the electricity that can use as a power charger. Second, it has a dual security password system which combines letters, numbers, and symbols to protect the illegal using from an irresponsible person. It is also equipped with a GPS Tracking System to track the position of the bag if it is lost or stolen. Then, it is waterproof that makes the users do not have to be worried to carry it under the rain. Another interesting thing is this bag made of composite materials which have lightweight but still strong and sturdy. By this innovative product, they could achieve a bronze medal and a special award from World Invention Intellectual Property Association (WIIPA) from the category of Necessary of Life. The special award is rewarded for the unique and helpful products which can be used in the daily. Five of them successfully managed as one of the best inventors among more than 500 teams from 25 countries around the world. “It is an amazing experience for my team and me personally because it is our first event in abroad. We really proved that a result will never betray the efforts. This is a meaningful challenge,” he added.